As white supremacist Richard Spencer was being interviewed on camera, a masked protester punched him square in the jaw. Many conservatives looked at this as evidence of “cry-baby” liberalism: unable to handle alternative points of view, leftists resort to violence to stifle “free speech.” This criticism has also been leveled against those who engaged in vandalism at the counter-inauguration protests and, more recently, at the UC Berkeley protests of another alt-right personality, Milo Yiannopoulos (despite the fact that the “violence” was proportionately negligible, given the size of these events). Even some liberals, progressives, and leftists, while abhorring the neo-Nazi rhetoric of Spencer, would not go so far as to condone the violence against him or at these protests. 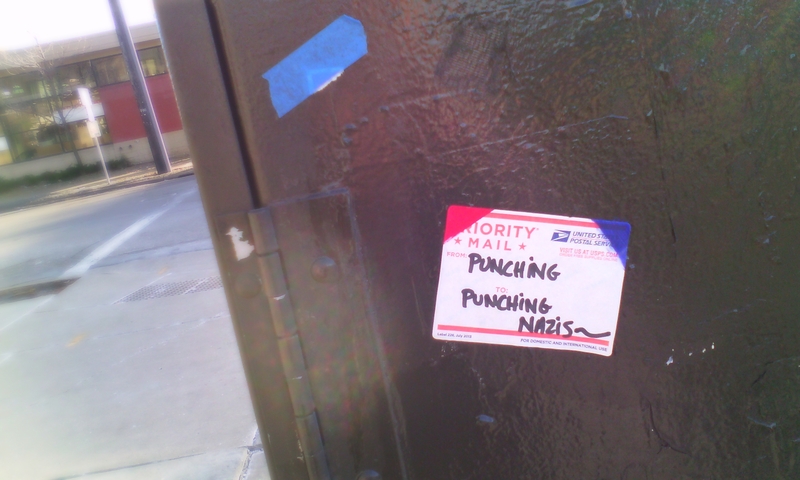 Fifty years ago, philosopher Jean Améry made a sustained argument for punching Nazis in the face, not only as an acceptable action, but one that might be required. A victim of torture by the Gestapo and a survivor of the Holocaust, Améry described his disturbing experience of torture at the hands of fascism, and defended, contra-Nietzsche, the role of resentment (ressentiment) as an essential element of human identity, dignity, will, and freedom, including its manifestation in violence, as in the time he punched a Nazi in the face. I had grasped well that there are situations in life in which our body is our entire self and our entire fate. I was my body and nothing else: in hunger, in the blows that I suffered, in the blow that I dealt. My body, debilitated and crusted with filth was my calamity. My body, when it tensed to strike was my physical and metaphysical dignity. In situations like mine, physical violence is the sole means for restoring a disjointed personality. In some of the most difficult-to-stomach passages in all of philosophy, Améry describes his torture. His hands were cuffed behind his back and were raised to the ceiling by a chain. “The balls sprang form their sockets. My own body weight caused luxation; I fell into a void and now hung by my dislocated arms… Torture, from Latin torquere, to twist.” The effects of his torture went beyond the physical: his own body, the very thing that allowed him to be an “individual,” the grounding of his freedom in the world, his most intimate “home,” now became the source of pain, was no longer “his,” but was now the weapon of the enemy. Nor is Améry simply describing the harm visited upon him as an individual, by the fists and sticks of the Gestapo. His scope is broader. In twisting the body, torture twists all of reality and “becomes the inversion of the whole social world.” Torture wounds the flesh and the spirit, but also the very conditions of possibility that make our world human and all that the concept “human” entails — morality, creativity, sociality, and freedom. Torture annihilates humanity. Torture is the essence of fascism. Fascism is the total control of all aspects of society — politics, economy, media — and in controlling these, controls the bodies and minds of the individuals of that society. Historically, this has been tied to theories of racial purity and superiority. While it might be possible to imagine a fascist society that is not racist, to advocate ordering the world along racial lines is to advocate fascism. Racism destroys plurality, creativity, and freedom. Racism destroys the very idea of a “human individual.” Racism twists and tortures the human world. Are there situations, per Améry, where it is acceptable, even required, to punch another human being in the face? Even most pacifists, when pushed, will acknowledge that violence is acceptable in cases of self-defense, where “self” can extend beyond the individual body or dignity to one’s property, family, community, or society. (This is precisely the purported rationale for most wars). Améry’s argument for Nazi face-punching isn’t a version of the argument for self-defense, however. Crucially, he acknowledges that his punch was not only futile, but would lead to even more pain being inflicted upon him, perhaps even death. In this way, Amery’s argument cannot be seen as a mere act of self-preservation, but as something that was demanded of him, as a human being, to preserve the integrity of the human world. His reasoning for Nazi-punching moves beyond ethical discourse into an ontological justification: what is at stake is not his individual body, but all of our bodies, and, perhaps, our world itself. Perhaps Améry’s and the protester’s punches are significantly different: Améry having been a direct victim of torture; Améry having “nothing to lose;” Améry not punching in public under the gaze of cameras, running the risk of having the footage propagated and manipulated for various agenda, or, even worse, turned into a joke, thus diluting the image. (That these “critiques” often come from people — both conservative and liberal — that are secure in their bodies is no small point). In fascism and racism, human bodies are on the line. 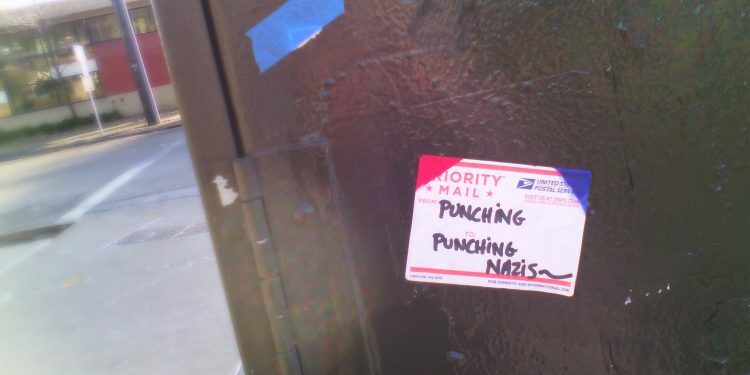 To condemn punching Nazis in the face is to condemn anyone who fights back against violent assault. It is to ask them to give their bodies and their lives over to an abstract ideal of “free speech.” It is to say that morality and reality exist on some ethereal plane, beyond faces and flesh and blood. It is, quite possibly, to accept the annihilation of the world itself. A racist is not evil because he holds a certain set of beliefs or uses certain racist words. A racist is evil because he is part of a historical and systemic violence that does destroy people — economically, politically, psychically, and, all too often, physically. (Richard Spencer advocates “peaceful ethnic cleansing.”) The racist not only destroys individual minds and bodies, but makes it impossible to be at home in the world, much less to share this home with others. The racist turns the friend into the enemy, the neighbor into the stranger, and the brother and sister into an alien. By destroying these bonds, the racist annihilates humanity. The racist is an acolyte of death. Maybe there are other, more effective ways to stand against the Richard Spencers and Milo Yiannopouloses of the world. But the two punches — that of the torturer and that of the tortured—are not equivalent, logically, morally, or otherwise. The first punch destroys. The second restores. The first punch is death. The second is life. The first punch is the enemy of humanity. The second punch is a friend, maybe even a hero, with the courage to confront the face of the enemy. Postscript: Améry writes that, “Whoever was tortured, stays tortured.” Despite his great contributions to philosophy, he never was able to feel at home in the world again. In 1978, he committed suicide by overdosing on sleeping pills. Instructor of Philosophy at Fordham University.